Studio aquatic apartment, the Bronx. Highly desirable neighbourhood, between the Bronx Zoo and Botanical Gardens. Privacy and environmentally sound. 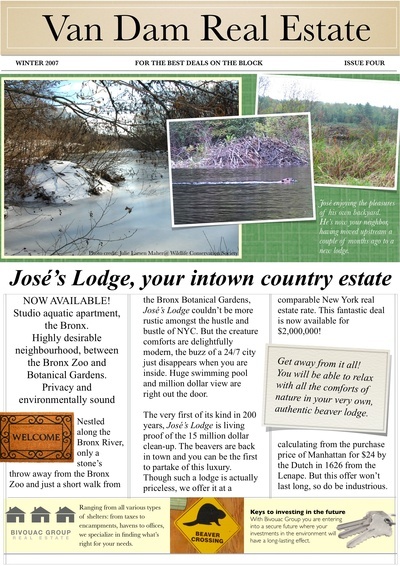 Nestled along the Bronx River, only a stone’s throw away from the Bronx Zoo and just a short walk from the Bronx Botanical Gardens, José’s Lodge couldn’t be more rustic amongst the hustle and bustle of NYC. But the creature comforts are delightfully modern, the buzz of a 24/7 city just disappears when you are inside. Huge swimming pool and million dollar view are right out the door. The very first of its kind in 200 years, José’s Lodge is living proof of the 15 million dollar clean- up. The beavers are back in town and you can be the first to partake of this luxury. Though such a lodge is actually priceless, we offer it at a comparable New York real estate rate. This fantastic deal is now available for $2,000,000! calculating from the purchase price of Manhattan for $24 by the Dutch in 1626 from the Lenape. But this offer won’t last long, so do be industrious. Get away from it all! You will be able to relax with all the comforts of nature in your very own, authentic beaver lodge. NY, NY, NY, so nice we named it thrice is an interactive, multimedia installation. 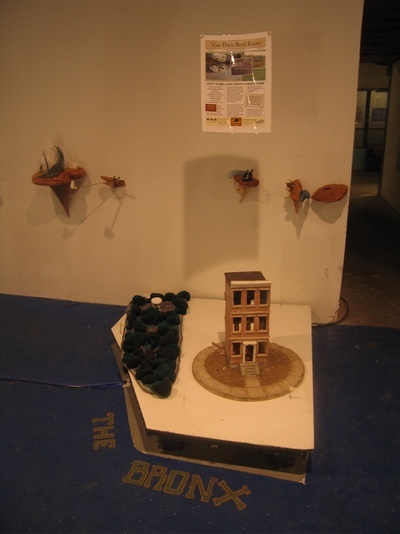 It is a continuation of Flux Factory’s interest in urban landscapes and takes inspiration from the Panorama, Robert Moses’ scale model of New York City in the Queens Museum of Art. In collaboration with over 100 artists from all five boroughs and around the world, this installation re-imagines the public and private spaces of New York. Each artist contributed a building, a landmark, a street, an avenue, a block, a park, a neighborhood, an expressway, a bridge, an island, an airport—one or several elements of the urban environment. 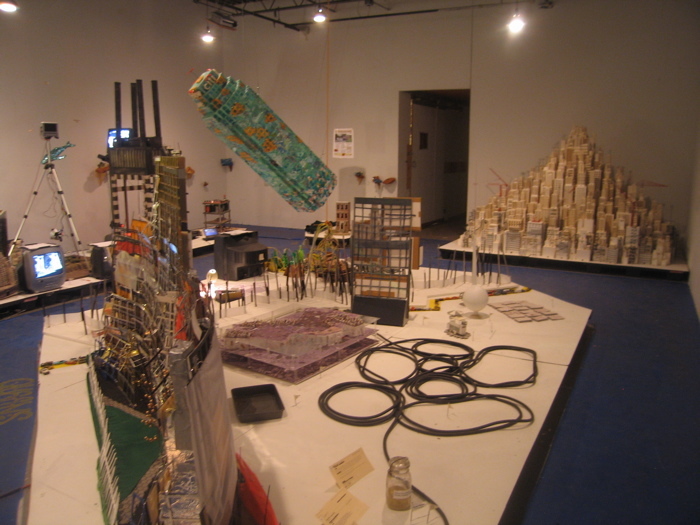 All of these individual works were combined to produce a cohesive yet chaotic installation, a multimedia, scale-model of the city. Instead of being an exact replica to scale of the city of New York, this project offers a mental map, a replica of an imaginary New York, an investigation into the collective unconscious of the cultural capital of the planet: The sum of all of New York’s potential exposed in a great experiment in psychogeography. Panorama is a scale model of NYC and its 5 boroughs in detail and is on permanent installation at the Queens Museum in NY. Every building, stream and park has been included and shows the bird’s eye view of the city. This group exhibition is modelled on this concept encompassing the entire space of the gallery where over 60 artists contributed works after claiming a certain area of the city.